Political bickering has blinded American leadership to the deeply rooted problems with the U.S. economy. America’s fundamentals remain strong—from its capacity to innovate to its high productivity. But the United States will only make the most of its potential if President Obama takes decisive action and with the support of Congress manages to increase savings, reform a healthcare system that is draining resources, and combat high levels of inequality. The economic problems facing the next U.S. president are well-known. The list includes stubborn unemployment, high indebtedness, chronic deficits, inadequate educational outcomes, decaying infrastructure, a dangerously vulnerable global economy, and the fiscal cliff. Equally well-known are the diverse and often divergent prescriptions offered to alleviate these woes—more government or less, fiscal austerity or continued stimulus, tax increases or spending cuts. President Obama has to find his way through the firefighting and address the underlying causes of the immediate economic challenges the nation confronts. Fortunately, the president will be supported in this task by America’s still-strong growth fundamentals. Contrary to popular impression and despite its many problems, the United States retains the potential to grow rapidly in the coming decades. That is not to say that the immediate threats to U.S. economic stability have been exaggerated. In fact, they represent a national emergency. But the consequences of falling over the fiscal cliff have already been extensively discussed, and the overwhelming majority of economists who have analyzed the U.S. fiscal imbalance agree that correcting it will inevitably require both government spending cuts and an increase in tax revenues. Avoiding the fiscal cliff is at its core a political problem that demands political solutions. These frenzied discussions on the immediate future have blinded many policymakers and commentators to the importance of addressing the roots of the nation’s fiscal instability. There are three priorities for restoring America’s fiscal health and realizing its growth potential: raising the national savings rate, containing healthcare costs, and mitigating income inequality. Avoiding the fiscal cliff is at its core a political problem that demands political solutions. In the current political climate, the possibility of making progress on such a reform program, or indeed on any one of its elements, will appear far-fetched. That may be. But one must know the cause of a disease to cure it, and fixing the United States’ economic problems is no exception to that rule. A nation no longer in economic free fall as it was four years ago should be capable of charting its own future. Contrary to the view of many commentators, the United States is in a very strong position to capitalize on the powerful forces driving contemporary economic growth, namely, technology and globalization. This does not, of course, mean that its potential will automatically be realized. The American economy remains the richest and most productive large economy in the world by a wide margin. It is more than three times the size of the second-largest economy, China, as measured by real GDP at market exchange rates. While China is projected to eventually overtake the United States, the Asian giant will remain a relatively poor country confronting major concerns about the sustainability of its economic, political, and social system. Reflecting its very high productivity, which many economists consider the best single measure of competitiveness, the United States continues to rank among the top ten countries on the World Economic Forum’s annual Global Competitiveness Index and the top five on the World Bank’s Doing Business Index. Although like nearly all advanced countries it has seen its share of world exports decline and developing countries gain export share, the United States has also seen exports grow rapidly as the latter’s imports boomed. Moreover, its ability to export as well as to buy what it needs from the world is substantially boosted by new gas and oil extraction technologies that are likely to greatly reduce its reliance on imported energy, shrink its current account deficit, and create new centers of economic growth around the country. In this year’s Annual Energy Outlook, the U.S. Energy Information Administration projects that, between 2010 and 2035, net U.S. oil and biofuels imports will fall from 49 percent to 36 percent of total domestic oil and biofuels consumption and the United States will become a net exporter of natural gas. The International Energy Agency forecasts that by 2017 the United States will become the world's top oil producer, overtaking Saudi Arabia and Russia. The cumulative impact of this shift on the U.S. economy could be large. In a report this March, Citigroup projected that increased domestic production of oil and gas and related activity, combined with constraints on domestic oil and gas consumption, could create between 2.7 and 3.6 million net new jobs, increase real GDP by between 2 and 3 percent, and reduce the U.S. current account deficit by 60 percent by 2020. The United States continues to exert a powerful attraction on foreign investors, not least because of its status as one of the world’s most innovative nations and the stability of its rules-based business environment. Despite the fact that the Great Recession originated in the United States, between 2006 and 2011 the country attracted $1.39 trillion in foreign direct investment (FDI), or 13.7 percent of the global total. In contrast, Japan and Germany attracted a meager 0.5 percent and 2.5 percent, respectively. The latest data on FDI inflows to China, for 2010, indicate that it received 8.7 percent of the total. The United States continues to exert a powerful attraction on foreign investors, not least because of its status as one of the world’s most innovative nations and the stability of its rulesbased business environment. While the United States makes up just 5 percent of the world’s population, it accounts for 28 percent of patents globally and is home to 40 percent of the world’s highest-ranked research universities. Its economy, driven mostly by technological and business innovation, is well placed to avoid the diminishing marginal returns that come from growth that is overly dependent on high rates of investment in public works, plants, and machinery—as is the case in several Asian countries, for example. At the same time, the United States’ great capacity to innovate is reinforced by its unique ability to quickly integrate migrants who are disproportionately represented among its successful entrepreneurs. Despite its defective immigration regime, the United States continues to be the preferred destination for the world’s professional class. The United States is enviably well positioned to benefit from open engagement in a rapidly expanding global economy. Finally, America’s population is younger, includes more children, and is growing faster through immigration than those of other advanced countries and China. Over the next twenty years, the U.S. labor force is projected to grow by 17 percent, while those of other Organization for Economic Cooperation and Development (OECD) economies are forecast to grow by a paltry 1 percent and China’s working-age population is projected to shrink by a little over 1 percent. This is an advantage because it expands the size of the U.S. domestic market and implies that there are proportionally more workers to support children and the elderly. These strengths make the United States enviably well positioned to benefit from open engagement in a rapidly expanding global economy. Over the next generation, emerging markets are projected to grow two to three times faster than advanced countries and to account for over half of the global middle class in the world, adding about a billion potential customers for products that the United States excels at producing. Still, the United States must overcome a number of obstacles before it can make the most of its potential. Most of the discussion about American profligacy tends to center on government spending. But another big reason that the United States has run a cumulative current account deficit of roughly $8 trillion over the last three decades is its low household savings rate. Low savings make it harder to finance large government deficits and can encourage a potentially dangerous overreliance on foreign financing. Low national savings (the sum of household, business, and government savings) are a far more important driver of the U.S. current account deficit than the often-touted but largely unsubstantiated loss of competitive edge by U.S. companies or workers. U.S. national savings are now so low that they do not even cover depreciation, the wear and tear on the nation’s stock of capital. That means the net national savings rate is now negative (see figure 1). In 2010, U.S. households saved less than 4 percent of their disposable income—more than they saved prior to the Great Recession of 2008 but still ranking 29 out of the 34 OECD countries. In 2011, net national savings as a percent of GDP was -0.7 percent. To put this figure into perspective, the equivalent rate was 6.1 percent in Germany, 6.6 percent in Japan, and an astonishing 40.6 percent in China in 2010 (the latest year data are available from the World Bank). Low national savings and limits on the financing that China, Japan, and other foreign investors will provide mean that U.S. domestic investment is also low by international standards. In fact, U.S. net investment (gross fixed capital formation minus depreciation) is -0.8 percent of GDP, the third lowest in the OECD. 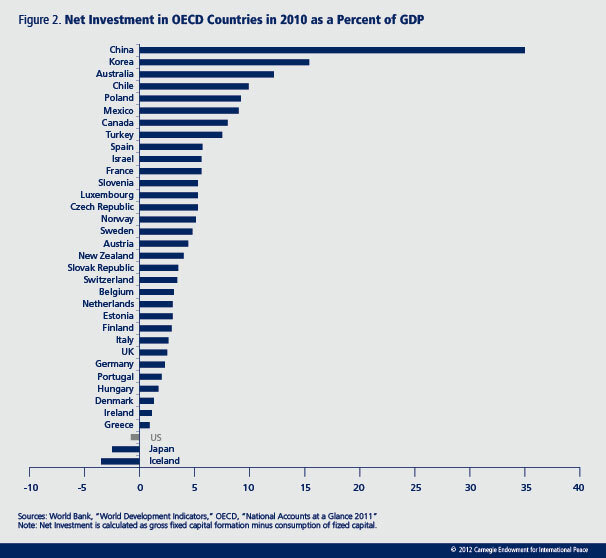 In comparison, net investment in China is 35 percent (see figure 2). This reduces the United States’ growth potential and hampers its ability to service already high debt that continues to grow. In the immediate pre-crisis years, exuberant spending by households in the United States was fueled by rapid economic growth and loose monetary policy. But more forces are at play. Compared to other advanced countries, the U.S. tax system not only raises less revenue but also is strongly biased toward taxing income rather than consumption, encouraging the latter. For example, most advanced countries apply a value-added tax (essentially a consumption tax) of 20 percent or more, but the United States relies on sales taxes that are typically in the upper single digits. The United States also has extremely low gasoline taxes—relative to other countries—raises very few luxury taxes, and allows for substantial tax deductions of mortgage interest payments. Increasing the household savings rate requires the United States to shift the tax burden from income toward consumption. America must also find ways to contain large, unfunded transfers from the young to the relatively affluent old—who are high spenders. And this should start with healthcare. Household overspending is clearly a problem for the United States. The other big spender is the public sector, as is evident in the ballooning fiscal deficit. In both cases, the enormous and rising cost of providing for healthcare is one of the main reasons the situation is so unbalanced and unsustainable. The United States currently devotes almost 18 percent of its GDP to healthcare—which is 80 percent more as a share of its GDP than the OECD average and 4 percentage points of GDP more than it spent in 2000. The U.S. healthcare system is not just the most expensive in the world; it is also the most inefficient and wasteful. But the U.S. healthcare system is not just the most expensive in the world; it is also the most inefficient and wasteful, and its coverage—even after Obamacare—is the least complete among advanced countries. U.S. GDP per capita is about 40 percent higher than the OECD average. Still, life expectancy, child mortality, and other performance indicators of the U.S. healthcare system are substantially lower than the OECD average—a group of rich nations that spends less than half as much per person on healthcare as the United States does. The United States has one of the highest child poverty rates in the developed world. The fact that one in five American children lives in poverty is a striking example of inequality of opportunity and outcomes. And it is simply scandalous that the life expectancy of white Americans who have not finished high school declined between three to five years over the period 1990–2008. The exceptionally high cost of healthcare in the United States can be attributed mostly to high prices rather than just more intensive use of healthcare services by an aging society. The most significant driver of high prices, in turn, is a combination of high administrative costs, bureaucracy, and high compensation for providers—particularly specialists. Most other advanced economies pursue lower healthcare prices more aggressively, with the government either setting prices up front or insurers and providers negotiating prices and the government stepping in to set prices if they cannot come to an agreement. But in the United States, providers often have much more discretion in price setting. A 2009 Dartmouth study found that the disparity in per person spending for the same healthcare services in different locations across the country can be as high as $2,300. The fee-for-service model that guides provider compensation in the United States also contributes to higher costs by creating an incentive for providers to emphasize quantity over quality. Other factors that push health costs higher include high markups in the medical device and pharmaceutical industries and higher administrative costs for medical payments than in a single-payer system in which the government collects all payments and compensates providers. Healthcare costs tend to rise much faster than the consumer price index, and the U.S. population is aging, which typically means higher costs. As a result, government healthcare spending could rise from roughly 10 percent of GDP to 16 percent of GDP by 2030, according to an International Monetary Fund analysis of recent Congressional Budget Office projections. Left unchecked, that trend alone will double this year’s projected budget deficit. Spending by individuals will also rise rapidly. While the healthcare reforms adopted in Obama's first term are a step in the right direction, there is a lot more that needs to be done to endow the nation with a system that is high quality, socially fair, efficient, and affordable. There is no silver bullet to solving this problem. Yet, there is also no shortage of sensible and in many cases internationally tested approaches to lowering costs while enhancing the quality of care. The United States could promote greater standardization in price setting as well as increased competition among suppliers—including international competition—comparative effectiveness research, sharing of information, and heightened transparency. More broadly, reforming the intellectual property regime to avoid spurious patents and limit the lifetime of patents to what is economically efficient can help reduce costs. In almost all other advanced countries a combination of these measures and more effective efforts at prevention have proven successful in containing healthcare costs well below U.S. levels without worsening health outcomes and while providing basic coverage for everyone. Of course, rising healthcare costs represent a risk to the stability of the U.S. economy, but they are not the only area of government and private spending that requires careful scrutiny. The United States spends 4.5 percent of its GDP on national security, according to Michael O’Hanlon of the Brookings Institution, compared to about 2.5 percent in other advanced countries. Given the respective size of economies, these figures are the source of the well-known statistic that the United States spends on defense almost as much as all other nations combined. With such an enormous gap, there is no reason to assume that opportunities to boost the efficiency of U.S. defense spending do not exist or that cutting defense spending imperils the nation. Another critical problem is the sharply widening distribution of income and wealth. The United States exhibits stagnant median incomes and declining average wages while incomes at the top of the distribution continue to rise rapidly. Yet, a plausible definition of economic success should surely include advancing living standards for most of the population, not just the privileged few. Beyond a certain level, high inequality is associated with a plethora of social problems, including chronic poverty, crime, and political divisions. Moreover, high inequality becomes entrenched and self-perpetuating, denying opportunities to those born to parents that are less well-off. Social mobility in the United States is now much lower than in Europe. A recent study by the OECD, for example, found that in the United States, fathers’ incomes are much more predictive of their sons’ incomes than in Australia, Canada, the Scandinavian countries, and much of Western Europe, suggesting that earnings mobility is more limited. This is strongly indicative of a squandering of human potential that is not only unfair but also undermines the country’s productivity and international competitiveness. The statistics are striking. According to broad measures of inequality among OECD members, the United States has the highest inequality of all advanced countries and its inequality is almost as bad as in Mexico—a developing and famously unequal country—as well as in Turkey and Chile, two other developing countries beset by high levels of inequality. The extraordinary fact is that since 1970, in the United States there has been almost no increase in the average income after inflation of the bottom 90 percent of households. The nation has actually grown faster than the average of other advanced countries, but the benefits of its growth have accrued almost entirely to the top echelons of the income distribution. Meanwhile, the income share of the top 1 percent of taxpayers doubled from 10 percent of total income to over 20 percent in 2012—this is the highest share since 1929. How unequal the distribution of income in the United States has become is evident when it is compared to the OECD average and to Sweden, an economy that navigated the Great Recession remarkably well, exhibiting both healthy public finances and one of the most equal income distributions in the world. 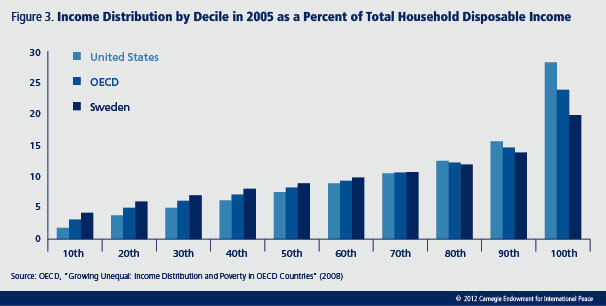 About three-fourths of those in the bottom two deciles of the U.S. distribution (those on the left of figure 3) are officially below the poverty line. While this trend of growing inequality is rooted in changes that have unfolded over the last thirty years, most notably skill-biased technological change and the many effects of globalization, it has been exacerbated by both institutional changes and policy decisions that have tended to favor the most well-off segments of American society. The United States stands out among other advanced democracies in that the government taxes its citizens relatively lightly and plays a relatively small—and diminishing—role in redistributing income from high earners to lower earners. For example, the interest payments on the mortgages that the wealthiest 20 percent of Americans are allowed to deduct from their income taxes account for a sum that is four times larger than what the nation spends on public housing for the poorest 20 percent. Still, there is ample room to reduce the U.S. fiscal deficit to a sustainable level and boost the standard of living of the poorest Americans. Income in the United States has become so skewed that even modest changes at the top of the distribution, ones likely to be more than offset by economic growth, would be translated into a substantial increase in incomes at the bottom of the economic pyramid—with a major impact on poverty. For instance, a number of comparatively small steps could help lower the fiscal deficit from the current 7 percent of GDP to 2 percent, thus placing the national debt as a share of GDP on a declining path. Economic recovery is projected to have deficit-reduction effects of about 2 percent of GDP. And cutting costs in the operation of government in the amount of just 1 percent of GDP would help. But increases in tax rates and reductions in transfers (such as spending on unemployment benefits) to lower the deficit by 2 percent of GDP would still be necessary. These measures would reduce the disposable income of American taxpayers by a similar percentage across all income levels: low-income groups would be as affected as those in higher-earning echelons. And that is not right. Given the large gap in earnings and its astonishing widening in recent years, Americans who earn more should pay proportionally more and poorer Americans should pay less. Americans who earn more should pay proportionally more taxes and poorer Americans should pay less. If reforms of taxes and social spending were to succeed in making the U.S. income distribution modestly more equal—moving it, for example, halfway toward the OECD average, or roughly a quarter of the way toward Sweden—households in the top income decile (average household income of about $120,000) would see their disposable incomes fall by about 9 percent, and those in the second decile would see their incomes decline by 3 percent. At the other end of the spectrum, the disposable incomes of the poorest households (those in the bottom income decile with an estimated income of $7,500 per family) would rise by a little over 36 percent. Millions of Americans would be lifted out of poverty and into the middle class. Those in the existing middle class that all politicians claim to represent would also see significant increases in their incomes. After this modest change, the average U.S. household in the top income decile would still receive an income more than ten times larger than the average household in the bottom income decile. This point applies even more powerfully to the top 1 percent of the income distribution, where incomes, on average, are some 260 times larger than those in the bottom decile. Thus, increasing the tax rates paid by the top 1 percent of taxpayers by just 4 percentage points would be enough to provide additional transfers to the bottom 10 percent of American households worth 50 percent of their income. These reforms do not have to be carried out overnight. If they are implemented over a seven-year period, for example, the effects of economic growth that have tended to accrue disproportionally to the upper reaches of the income distribution would almost certainly easily offset the effects of higher tax rates and reduced benefits. The policies required to deal with high and rising inequality are well-known and have been widely applied in other countries—including the United States beginning in the 1930s and over much of the twentieth century. In addition to a more progressive tax code, policies could be implemented that reduce exemptions and subsidies that favor the wealthy, increase educational opportunities, and provide more accessible healthcare for lower-income groups. Judging from the performance of countries in which inequality is not nearly as high as in the United States, such as Sweden and Canada, there is no reason to assume that, as critics argue, these measures would result in a less vibrant investment climate, a slower economy, or reduced international competitiveness. In fact, a recent International Monetary Fund study found that growth tends to be more sustained in countries where inequality is moderate than where it is high. The United States must not be allowed to fall off the fiscal cliff. Given the dismal state of the U.S. job market and the fact that a record number of Americans—over 15 percent—live under the poverty line, now would not be a good time for the world’s largest economy to undertake a huge and immediate fiscal contraction. Combined with a deterioration of the chronic crisis in Europe, such a contraction could easily throw the United States and the world into a second and possibly even more devastating episode of the Great Recession. Allowing this to happen would be the height of irresponsibility. It seems likely that a political deal will be reached and that the United States will find a way to avoid falling off this cliff. But the United States needs and deserves a fiscal arrangement that aims at more than simply achieving the minimum common denominator acceptable to both sides and avoiding a disaster. In addition to a more progressive tax code, policies could be implemented that reduce exemptions and subsidies that favor the wealthy, increase educational opportunities, and provide more accessible healthcare for lower-income groups. It is vital to break the trend of high and rising costs of healthcare. Moreover, the vicious circle that exists between the fiscal deficit and low household savings on the one hand and high and rising inequality on the other must be broken. The large fiscal deficit makes it impossible to invest in education and infrastructure and provide poorer Americans with an adequate social safety net. At the same time, high and rising inequality makes it impossible to fix the deficit with broad-based taxes or across-the-board cuts in spending without causing unacceptable social dislocation. A greater burden must be carried by the wealthier segments of the population. It is possible to break the vicious circle at various points, and the United States has the policy instruments to do so. Healthcare costs can be contained through greater use of the government’s purchasing power, encouragement of competition, better preventive care, and other measures. U.S. consumption taxes can be raised moderately, and the poor can be compensated through more social spending on education and outright transfers. Meanwhile, in order to achieve the needed fiscal stabilization, taxes also need to be raised only moderately and exemptions reduced for those at the higher end of the income distribution. These steps would sharply increase overall national savings, affording more resources for investment and spurring economic growth. In turn, a more confident, less fiscally constrained America would be better able to strengthen ties with trading partners and encourage freer trade and foreign investment, securing increased access to the world’s fastest-growing markets. This too would boost growth and push down the fiscal deficit, all of which feeds positively into more growth and macroeconomic stability. Provided it can find a way to agree to rein in its excess spending and mitigate its rising inequality, the United States is likely to retain an enviably dynamic economy perfectly capable of growing its way out of its fiscal crisis and competing in world markets while innovating and creating jobs. Provided it can find a way to agree to rein in its excess spending and mitigate its rising inequality, the United States is likely to retain an enviably dynamic economy perfectly capable of growing its way out of its fiscal crisis and competing in world markets while innovating and creating jobs. If a way is not found, however, not only will the living standards of most Americans continue to decline and political divisions deepen further, but economic stability will increasingly be put at risk by rising government debts. The nation will, moreover, continue to suffer an erosion of the institutions and practices that underpin the international liberal economic order that has served it so well for over half a century. Compared to advanced and most other countries, the United States is in much better shape, and its economic problems are actually quite manageable. Provided that policymakers can break the severe political gridlock that has impaired economic policymaking—admittedly a very big if—a country that is no longer on the verge of financial collapse, with an economy that is not spinning out of control as it was four years ago and that is indeed showing a modest but sustained recovery, is a better launching pad for the needed fiscal reforms than it was at the height of the recession. Moreover, a society that has been sensitized to the explosion in inequality and its many toxic consequences should also be a society more inclined to support the decisions that will bring back a distribution of income that is economically more efficient, politically more stable, and morally more acceptable.